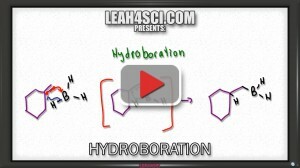 Hydroboration-oxidation is yet another alcohol yielding alkene reaction. However this reaction results in an alcohol adding to the less substituted carbon for an anti-Markovnikov product. The video below helps you understand the reactivity of Boron as well as the hydroboration and oxidation steps of the reaction mechanism. When alkyl group is kicked by B then why does it attacks the Oxygen bound to B and not the other oxygen? Thank you for the video, amazing explanation. I do have a question though, if we are in a basic solution and it is okay to have OH-, and it was reactive earlier on and attacked the Boron when it was linked to 3 O_R, does OH- at the end continue to break and form bonds with B(OH)3? What did you find tricky about the video Rogieto?